On this page, we will introduce a partition tool for Windows users (Windows 7/8/XP/Vista and Windows Server) to extend volume without losing any data. Download IM-Magic Partition Resizer Server to extend disk partition on Windows Server when it pos up low disk space warning message. System partition is running out of disk space on Windows? Windows Server says low disk space alert message on C drive? Data volume runs on low disk space with lots of important data inside? All these problems can be resolved with third-party partition software, with which you are able to extend disk volume without touching original data stored on the partition. IM-Magic Partition Resizer Server is Windows Server partition software, which can work on Windows 2003, 2008, 2012, Windows SBS 2003, 2008, 2012, Windows Server 2003 R2, Windows Server 2008 R2 and Windows Server 2012 R2 and more. How to Extend Partition Step by Step? Download, install and launch IM-Magic Partition Resizer Server. 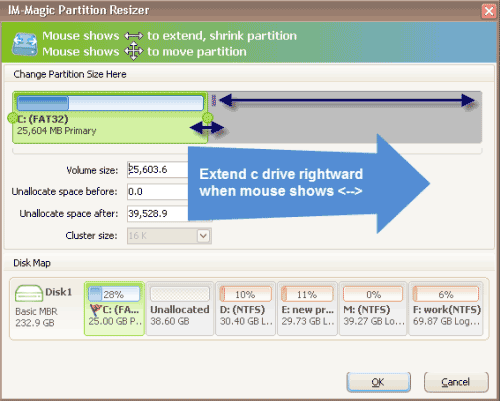 Right click a partition that has enough available space and select "Resize/Move" option. When mouse shows double arrows, you can move the arrows to shrink the selected partition. Then, you can see some unallocated space. You need to move the unallocated space close to the partition you ant to extend. Then, you can right click the partition you want to extend and select "Resize/Move" option. Move the arrows to extend the partition and click "Apply" button. A hard disk can be divided into several partitions including system partition and data partition. Disk partition will run out of disk space while more and more data is stored. However, you may not want to delete any data to free up the disk space since all the data is important to you. Then, how can you fix the problem when disk partition is getting full on Windows? "D drive only has little available space on my PC with Windows 7 operating system. 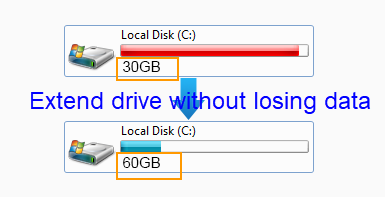 The other partition C drive still has some free space, so I want to move some free space from C drive to D drive. But I don't want to lose any data during the partition resizing. Can anybody help?" "Windows Server 2003 runs on low disk space on C drive, but I cannot delete any data from this partition. The Diskpart command failed to help me extend C drive by saying the selected drive cannot be extended. I don't know why it says such a message, but I have no other idea to extend C drive on Windows Server 2003." Diskpart can extend disk volume on Windows Server 2003, 2008, 2012 and more other Server OS, but unfortunately Diskpart is unable to extend a system partition or an FAT32 partition. If you want to extend system partition without touching the operating system and with data untouched, IM-Magic Partition Resizer Server is the best choice because it provides a secure way to extend system partition on Windows Server without losing any data. This partition software is specialized Server partition magic, with which you can extend system partition without reinstalling system or rebooting your computer. If the partition you want to extend is not system partition, you can run Diskpart command. What you should know is that Diskpart only allows you to extend NTFS partition when there is contiguous unallocated space behind the partition you want to extend. In another word, if the partition you want to extend is FAT 32 file system, you need to convert it to NTFS before you can perform partition resizing. Besides, if there is no contiguous unallocated space, Diskpart command will fail to extend the partition, too. However, if you can use IM-Magic Partition Resizer Server, you can extend a disk volume without facing all these problems mentioned above because this software enables you to making unallocated space easily and allows you to extend NTFS and FAT32 partition. Most home PC users would like to install Windows XP, Windows 7/8 or Windows Vista operating system. IM-Magic Partition Resizer Server can also work on these operating systems. In addition, you can also rely on IM-Magic Partition Resizer Free, which is free version of partition software for Windows 7/8/XP/Vista users. It can help extend system partition, boot partition, primary partition and data partition without touching even a single data on the disk. In a word, this partition software is able to solve low disk space warning in Windows Server and Windows 7, 8, 10, etc.